Wir begrüßen Sie in einem Studio von 30 m2, unabhängig und im Erdgeschoss eines Hauses in der Altstadt umgeben ist. Das komplett renovierte, vermischt sich dieser Raum sowohl den Charme des alten und den Komfort der Moderne! Der Wohnbereich verfügt über ein großes Fenster, und verfügt über eine voll ausgestattete Küchenzeile. Der Nebenraum verfügt über ein separates Bad mit Waschbecken, geräumige Dusche und WC. Bettwäsche und Handtücher zur Verfügung gestellt. Reinigung ist im Preis inbegriffen. Das Studio ist mit Wi-Fi ausgestattet. Im Sommer werden Sie die Frische eines Steinhauses zu genießen, und Sie die provenzalische Sonne auf einem hübschen Platz nur 2 Minuten vom Haus zu genießen. Sie können Ihr Auto kostenlos auf dem Parkplatz des Bahnhofs, nur 5 Minuten vom nächsten Studio oder 2 Schritte von der Wohnung auf dem Boulevard E. Park Combes. Es ist eine grüne Zone: € 10 pro Tag oder Tiefgarage, Boulevard Des Lices 5min Studio: 14 € pro Tag. Ein Aufenthalt von großer Süße in einer schönen und charmanten Stadt. Ensuite; 1m20 x 90 Dusche, Waschbecken, WC. ideale Lage in der Stadt. Merci et bonne continuation à vous deux. Sehr durchdacht, gut eingerichtet und in bester Lage. We had a lovely time in beautiful Arles. Our apartment was wonderful and our hosts, Catherine and Francois made us feel very welcome. I traveled to Arles and Provence solo the first week of October. This little studio was the perfect place for me while I was there. 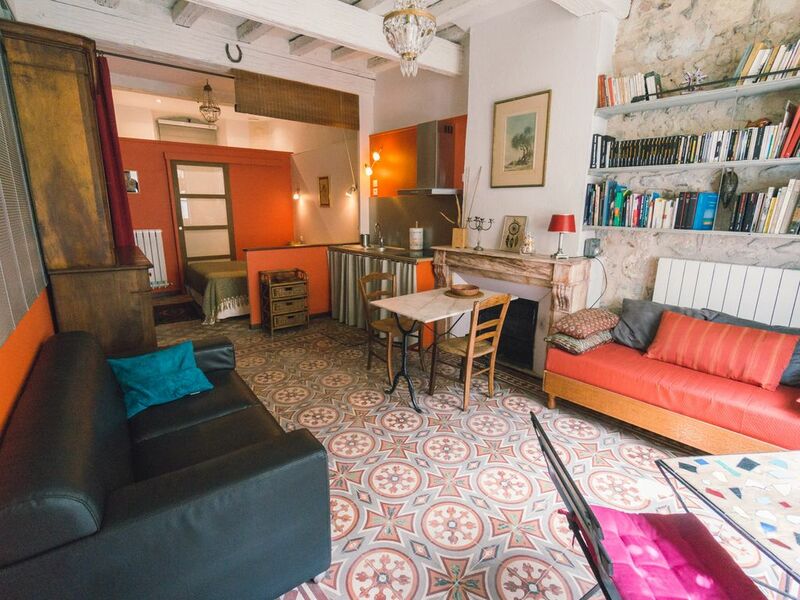 An easy walk from the train station and located just minutes from the Center of Arles and all it has to offer. The space was clean, thoughtfully decorated, and very comfortable. While I never cooked any meals there (other than grabbing some breakfast), it was stocked with enough of the basics that you could have pulled together a simple meal if you wanted to. I can't say enough about my hosts, Catherine and Francois. While I only met Francois once at the end of my stay, I interacted with Catherine on a number of occasions both leading up to and during my visit. She was prompt and gracious in all of her replies. By the time I got to Arles, I felt like I knew her! The hospitality did not stop once I checked in - she left me a bowl of simple homemade jam at check in and continued to leave me little "gifts" throughout my stay - a small bowl of tapenade with baguette toasts one night and a small piece of cake another. In short, she really made me feel at home. I would definitely recommend this small studio - especially for the solo traveler. Thank you Catherine for a wonderful stay. Thank you very much Margo for your lovely appreciation! It would be a pleasure to see you again. Charming Studio in Great Location! My husband and I had a lovely one week stay this September in this charming apartment. The modern bathroom is fabulous with a large walk-in shower and stone wash basin. Even though they were still having hot weather, in the 80s every day, the stone walls and large fan kept us comfortable. The location is terrific, set between the train station on one side and the major sights on the other. We walked everywhere and there are lots of great restaurants within a 2 to 10 minute walk. We did several day trips by train visiting L'Isle-sur-la-Sorgue for the Sunday Market, Avignon, and Nimes. Catherine and François couldn't have been nicer, helping us decipher train schedules online, solving a cell phone problem where the person only spoke French (we don't) and dropping off several homemade treats for us during our stay, including two slices of delicious Quiche Lorraine. This is the perfect place to live like a local and enjoy all Arles has to offer. Thank you very much for this appreciation, it has been a pleasure to welcome you, you are extremely pleasant travelers ! Have a good holiday and see you again. Compleet ingerichte studio met een heel eigen sfeer .Onze ervaring is, dat het ook voor een langer verblijf een prima adres is. De heer en mevrouw de Bortoli zijn behulpzaam en hartelijk. Zij gaven ons goede informatie over Arles en omgeving. Als wij opnieuw in deze omgeving komen, dan willen wij zeker daar weer verblijven.